Relaxation and conversation have never been as cozy as when you complete your living room setting with this lavish sectional sofa. The extra thick back and plush pillow arms will softly envelop you while you sink into the resilient comfort of the high density foam seat cushion. Featuring two arm seats and an arm-less seat with power reclining controls, you will have a hard time vacating the comfort of this sectional sofa on game-days, movie marathon nights, and even everyday use. The Pasadena Power Reclining Sectional Sofa with Armless Recliner by Flexsteel at Crowley Furniture & Mattress in the Kansas City Area: Liberty and Lee's Summit, MO & Overland Park, KS area. Product availability may vary. Contact us for the most current availability on this product. 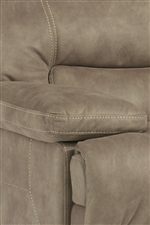 The casual, modern construction of the Delia Collection from Latitudes is an inviting series that breathes excellent comfort and ultimate versatility. With the pieces featured in the Delia Collection, many configurations are at your discretion from a simple three piece sofa set or think big and use many pieces to create the ultimate L-shaped sectional sofa. High quality construction methods like the time-tested Dualflex springs and softly supportive seat cushions ensure that this is a tremendous purchase. Whether you are feeling listless or an elderly person needing assistance, this collection has the functionality, versatility, and coziness to bring casual comfort into your home. The Pasadena collection is a great option if you are looking for Casual furniture in the Kansas City Area: Liberty and Lee's Summit, MO & Overland Park, KS area. Browse other items in the Pasadena collection from Crowley Furniture & Mattress in the Kansas City Area: Liberty and Lee's Summit, MO & Overland Park, KS area.